Seventy years down the line, Orwell could not have been more correct. This is for all those who have switched from normal home-cooked food to takeaways. Rajma-chawal and dal-bhaat , or even the occasional pasta bake, have the right ingredients. Pizzas don't. And pizzas cost more. The point is all about what's happening to our consumption habits. What is clear is that Indians are spending more, but they are spending less on buying food. The National Sample Survey Organisation (nsso) has computed the monthly per capita consumption expenditure during 2004 to find that rural Indians spend roughly 57 per cent on food-related items, while urban Indians spend 46 per cent. More importantly, the household food budget has been thinned out to buy less cereals and spend more on beverages, refreshments and processed food. Rural India spends Rs 37 on buying processed food and beverages, which is 10 per cent of its food expenditure in the month, on an average, across all categories of households. Urban India spends Rs 101, or roughly 20 per cent of its food expenditure. Both urban and rural India spend more on buying processed food and beverages, than they do on buying fruit for the family. 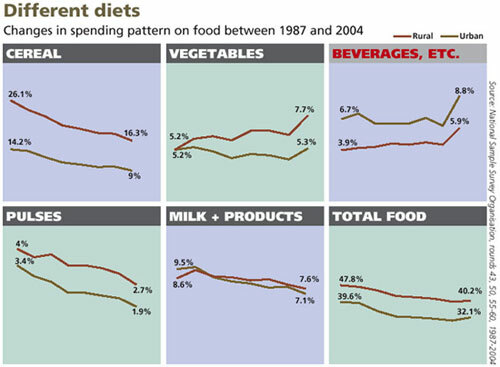 In the case of urban India, the spend on processed food is even greater than that of the vegetables it buys each month. It certainly spends more on beverages than it does on milk and milk products. Desiring the lucrative and fast-growing market, food processors and retailers, including multinationals, have pulled out all stops to extend their business across the country. India is the only place where Pizza Hut has opened fully vegetarian eateries. Food habits are changing. In 1987-1988, rural India spent 26 per cent on cereals but by 2004, it was spending only 16 per cent on cereals. In the same period, its spending on processed food and beverages went from 4 per cent to 6 per cent of its food expenditure. Urban India reduced its spending on cereals from 15 per cent to 9 per cent of its food expenditure, while processed food and beverages increased from 7 per cent to 9 per cent of the household expenditure on food. 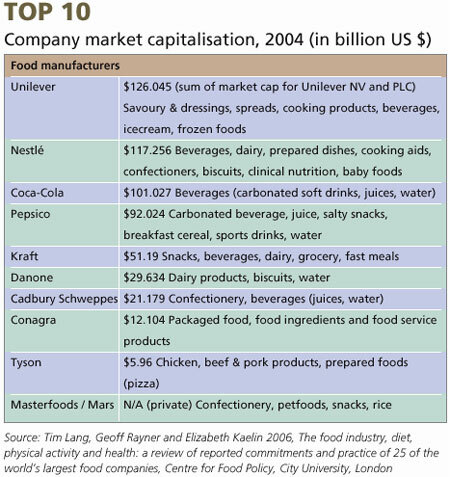 What makes the food industry salivate is the fact that this spending is not restricted to the elite. This is 'mass' produced food for the 'masses': this factory food is reaching poor households in urban and rural India. The same nsso data shows that in rural India, households with a monthly per capita consumption expenditure of as little as Rs 225, spend Rs 6 on buying processed food and beverages, while their richer counterparts, with Rs 950 or more to spend, buy processed food worth Rs 100. In other words, even the poorest are hooked. The same is the case with the urban poor -- spending Rs 11 out of their food budget of Rs 158 or roughly 7 per cent on processed food and beverages (see graph: Different diets). In other words, the business of processed food has entered the kitchen and is a major part of the diet. The problem is that while industry is getting into our homes, the quality of our food intake seems to be declining. nsso data in its 55th round (1999-2000) estimated that the average per capita fat consumption was increasing exponentially in rural and urban India. "With the advent of the fast food culture, people eat more of packaged food and fast food like pizzas, burgers, chips and soft drinks. This leads to an increase in our calorie intake which disturbs our metabolic activities. Disturbed metabolic activity and a sedentary lifestyle lead to an increase in the chance of obesity, which has become a rule rather an exception in the upcoming generation. Type 2 diabetes (which basically come as a free supplement with obesity) has increased. This compounds the risk of heart attack," says Navjeet Talukdar, heart specialist at the Batra Hospital and Medical Research Centre, Delhi. The business of food is not restricted to processed food. Today, Indian homes increasingly buy processed or packaged cereals and processed edible oils to cook food. Several steps have been added in the journey from the field to the plate. The farmer, the only producer earlier, is today seen as a mere supplier of raw material to an industry that churns out modern 'food'. Processed and packaged food, today, constitute almost 100 per cent of what is eaten in industrialised countries. This is the model Indian planners would like to emulate. In the name of the farmer, who will supply raw materials, the government is offering policy incentives in this 'sunshine' sector. Industry is joining the food processing bandwagon -- from Reliance to the Bharti group. 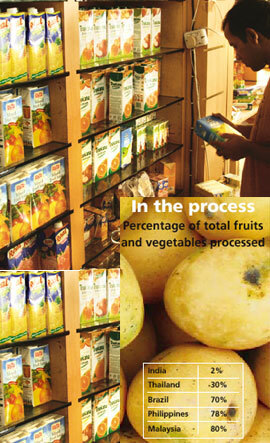 Reliance has entered the agri-horticulture and processed food sector and has exported fruits and mango pulp in 2005-2006. Reliance has also started more than 100 fast food joints at petrol pumps it owns along various stretches of the golden quadrilateral and north-south/east-west corridor. The Bharti group has made a big foray into food processing and horticulture. mncs are also taking over. Nestle, Brooke Bond, the Danone group, Cadbury's, Perfetti, Heinz and Hindustan Lever control various segments of food processing. In the soft drink sector, the market belongs to just two companies, Pepsi and Coca-Cola. Coke acquired Parle brands and Pepsi Dukes. India is the second largest producer of food in the world, next to China, despite the fact that agricultural productivity remains abysmally low when compared to industrialised and most developing nations. With a little increase in productivity, India has the potential of being the largest producer. Although a small percentage of food produced is processed -- 2 per cent of fruits and vegetables and 37 per cent of milk-- the food-processing industry is the fifth largest industry in the country in terms of production (see table: In the process). Estimates of industry size vary between Rs 300,000 crore and Rs 350,000 crore, representing more than six per cent of gdp in 2003 and accounting for six per cent of total industrial investment. There are more than 7,000 food-processing units in the organised sector and thousands of small units in the unorganised sector. The sector employs 1.6 million workers and has been witnessing a growth rate of about 15 per cent per annum. It accounts for 13 per cent of the country's export. The main sub-sectors include fruits and vegetable processing, dairy, meat and poultry processing, fisheries, consumer and value-added foods including packaged foods, soft drinks and other beverages and packaged drinking water. The government has been giving fiscal and policy incentives to the sector in successive budgets. A double-digit growth is expected to continue. Fruit and vegetable processing, currently at 2 per cent of total production, is expected to increase to 10 per cent by 2010 and 25 per cent by 2025. But the most lucrative sub-sector remains the processed/packaged food and drinks sector, between Rs 100,000 crore to Rs 120,000 crore. That is about a third of the total food processing industry. According to India Brand Equity Foundation (ibef), value addition of food products is expected to increase from the current 8 per cent to 35 per cent by the end of 2025. Packed tea is the largest variety of packaged food consumed, followed by biscuits. Soft drinks are a close third. Manufacturing of soft drinks has doubled from 1999 to 2004. ibef estimates that there are more than seven million outlets retailing soft drinks in the country. 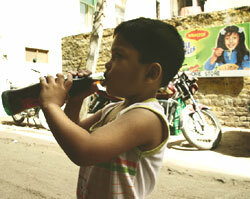 Coca-Cola has found innovative methods to penetrate rural areas, hitherto a small market (see box: Rural revolution). It is established that change in food habits accompany urbanisation. "Previously we used to get our wheat milled at the neighbourhood chakki (mill) but now we get it packed," says Anita Singh, a housewife. Availability of fresh food, milk and vegetables is restricted in urban areas and usually much more expensive than packed food. Buying fresh food, cooking and then eating at home is time-consuming. Euromonitor International, a market research company, has found that the amount of money Indians spend eating out has doubled during the past decade to about Rs 22,500 crore a year. This is expected to double in only half the time. This shift in food habits is clearly visible. Indians are spending more and more on junk food. And not just in urban areas. There are a number of safety issues with the fast-growing food industry. And it is not only adults who may be affected; even the unborn child is at risk. "Studies note that there is a consistent relationship between unhealthy diet and the emergence of a range of chronic non-infectious diseases -- including coronary heart disease, cerebro-vascular disease, cancers, diabetes mellitus, dental and various bone and joint diseases," write researchers Ulla Uusitalo Pirjo Pietinen and Pekka Puska, in a paper entitled Dietary transition in developing countries: Challenges for chronic disease prevention. According to the Baker hypothesis, also called thrifty phenotype hypothesis, poor foetal and infant growth due to malnutrition "programmes" the development of non-communicable diseases (ncd) risk factors like hypertension and impaired glucose tolerance. Processed food that is rich in fat and sugar -- burgers, pizzas and soft drinks, for example -- are mostly responsible for this. who's strategy on diet, physical activity and health identifies food as a major factor for the rise of ncds. "New choices have replaced traditional diet. While some of the choices enhance diet, others are high in fats, sugar and salt content. They come in a highly processed form and contain higher levels of protein, sourced from animal products. They are also advertised on a large scale, thereby contributing to changing people's expectations and displacing healthier foods," reads a report of the Centre for Food Policy, City University, London. "This 'Diet and Nutrition Transition' may be partly explained by the changing choices that the consumer faces. It is also a reflection of the economic realignment of the food chain, from production to consumption. Between 1988 and 1997, foreign direct investment in the food industry increased from us $743 million to more than us $2.1 billion in Asia and from us $222 million to us $3.3 billion in Latin America. This is higher than even investments in agriculture," it adds. "Economic development with recent technological innovations and modern marketing techniques has modified dietary preferences, and consequently, led to major changes in the composition of diet. There has been a shift towards high-fat, refined carbohydrates and low-fibre diet," the paper authored by Uusitalo, Pietinen and Puska reports. This change in diet took place in the industrialised world over a period of 200 years. According to researchers, however, dietary changes in developing countries are taking place in a span of decades, bringing with it a number of health issues to be concerned about (see box: Unwanted flab). Growing demand for food has also led to the creation of industrial agriculture. Seasonal crops are grown all round the year, under controlled conditions. Crops, fruits and vegetables are grown in alien agro-climatic conditions through intensive use of irrigation, chemical pesticides and fertilisers. Processing leads to addition of various chemical and synthetic inputs for a variety of reasons like colouring, preservation or just for enhancing taste. 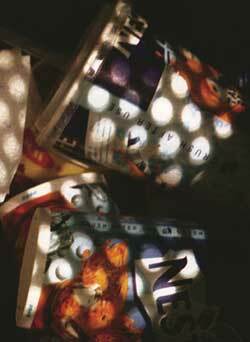 All these additives come with their own set of problems (see box: Unwrapped). Regulations have been re-engineered the world over to counter these threats. Threats are of two kinds -- acute and chronic. Most of the existing laws address the acute impacts, for example, the Prevention of Food Adulteration Act. Acute impacts are visible health problems that occur within a short while after consuming unsafe food. This includes food-borne diseases caused by bacteria, viruses, parasites, chemicals and toxins. However, it is important to focus on the chronic threats as well, a realisation that may be gradually seeping in for they are much more dangerous. Chronic threats are caused by tiny doses of chemicals like pesticides, heavy metals, antibiotics and industrial chemicals present in the food over a period of time. Very small doses of these invisible chemicals often accumulate and trigger major health problems. Cancer, asthma, blood pressure, heart diseases, neurological disorder, reproductive and fertility disorders are attributed to exposure of such chemicals through food. In industrialised countries, new regulations have been introduced, like the us Food Quality Protection Act, 1996. Existing regulations are also being amended to check the increasing chronic impacts of industrial agriculture. Regulating these toxins requires a completely different strategy. Standards for chronic impacts must be based on a safety concept called "acceptable daily intake (adi)". adi is the maximum quantity of a chemical or a toxin that a person can be exposed to every day without any health risk. It is defined on the basis of body weight, which means that a specified amount of chemical per kg of bodyweight can be safely eaten every day. This exposure can come from food, water and other environmental media. Pregnant women and children, of course, require the extra-safety factor. To enable such regulations, it is imperative that end product standards are set for toxins for processed as well as unprocessed food. While setting these standards, the entire food basket of a particular country or region has to be taken into consideration. The standards of pesticide, heavy metals and chemicals for food commodities have to be such that the total intake of these chemicals from all the food commodities does not exceed the adi of either a child or an adult. In the monsoon session of parliament, beginning July 2006, the government proposes to table the Food Safety and Standards Bill (fssb), which it says will assure food safety for all. The bill will replace the present Prevention of Food Adulteration (pfa) Act, the Essential Commodities Act and repeal other food-related legislations at the state level. While the new bill has been prompted by the need to reform legislation for industry's convenience and growth, it may have safety and health implications on people. Delivery has been laboured and contested. But the chosen midwife -- the industry-friendly ministry of food processing industries -- has delivered a product that is currently embroiled in a bitter battle between the ministry of food processing industries, supporters of the bill, and the ministry of health and family welfare, the custodian of food safety in the country. But that is just shadow boxing. The real fight is about industry's control over the business of food regulation by further diluting the already weak provisions that protect the health of consumer. If the new law is passed, industry will have won the war, because it wrote the first draft and all that has followed is tinkering. The idea of an "integrated food law" emanated from a committee headed by industrialist Nusli Wadia, with two other industry members, Ratan Tata and A C Mathiah. This committee, set up in 1998 by the National Democratic Alliance government, recommended framing a law that would avoid the existing multiplicity of legislations and agencies in the business of food. In the budget of 2002, the then finance minister Yashwant Sinha announced that the prime minister had set up a group of ministers, under the Union minister of law to prepare a modern integrated food law and related regulations. In the very first meeting it was decided to hand over the task of formulating the draft law to the industry-friendly ministry of food processing industries. One of the first set of recommendations was prepared by the Confederation of Indian Industry (cii), a group of powerful industries. The present United Progressive Alliance government decided to take forward the food safety agenda, without any changes. The industry-prepared draft was worked upon. And the battle for consumer safety was lost. The preamble to the act says the purpose of the bill is "for laying down science-based standards for articles of food and to regulate their manufacture, storage, distribution, sale and import". The industrial agenda is flagged by the emphasis on science-based standards, when most international food safety related legislation emphasises the need for health-based standards. The reason is simple: "good science' cannot be defined, while good health is a societal value. But industry has always found safety in science's uncertainty. The bill is clear in its intentions: the right to health must be weakened. The bill works hard to convolute, compromise and obfuscate the protection to consumer safety and health. It weakens the existing weak provisions of the pfa Act, with expertise and legalistic sophistication. The standing committee on agriculture, which submitted its report to parliament on the bill, has made many suggestions (see box: Dissenting voice). But the core elements of the bill, which make it fundamentally fatal to health and safety, have been insufficiently addressed. A careful reading of the proposed bill reveals that it does little to protect the safety and health of consumers or the interests of small producers. Besides, it does nothing to improve the shortcomings of the current food regulations and enforcement. The bill has weakened the definition of 'unsafe' food. First, it defines "contaminant as anything which is not added to food but is already present because of production-related causes (including operations carried out in crop husbandry, animal husbandry, veterinary medicine or as a result of environmental contamination). In other words, pesticide residues in soft drinks, or hormones or antibiotics in milk are all defined as contaminants. So far so good. But then it adds another term "extraneous matter", which has the same definition as contaminant, except that this matter does not render the food unsafe. In other words, pesticides that are unintentionally present in soft drinks could be contaminants or they could be extraneous matter, because companies say that these do not make food unsafe. This is further connected to another ambiguous definition for unsafe food. The definition does not refer to contaminants. Simply put, it means that even if food contains contaminants, it is not defined as unsafe. Furthermore, interpretation is now fraught with confusion. Food companies can argue that what has been found in their product is not a contaminant but extraneous matter and so their product is not unsafe. All this will make consumers run between the lines to prove what is unsafe, what is contaminated, what is injurious to health and what is just extraneous matter and not unsafe. Second, the bill does not say that food is unsafe if it does not meet stipulated standards The pfa Act says that food is adulterated if the quality or the purity of the product falls below prescribed standards. But the new bill only says that such food will be sub-standard, but not unsafe. It mentions that no article of food can contain contaminants in excess of standards, but does not say that if present, this will make food unsafe. It takes the same view on food containing pesticides, or antibiotic or microbiological elements in excess of standards. The bottom line is food should have no contaminants at all. Introducing definitional quibbles about what a contaminant is and what "extraneous matter" is, is a way of obfuscating this fact. There are no penalties for food with contaminants either. And incidentally, it is called the food safety bill.  It dilutes the provisions that would regulate quality and safety of large producers by weakening the provisions to recall food found unsafe; providing for penalties that are uniform across categories of manufacturers; and by giving the big companies an 'improvement' clause -- time to fix things.  Simultaneously, it brings into its ambit primary food so that all problems of quality are blamed on the raw material used in the manufacture and not on processed food. 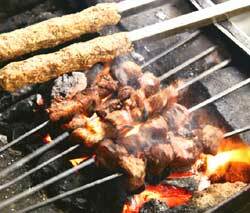  It also includes food retailers, hawkers, itinerant vendors and temporary stallholders. This was cii's explicit demand, which has recorded that this category of merchants must be brought into the legal net because they are the real problem.  It strengthens penalties for small producers. It also keeps intact the regulatory framework of pfa Act, which will tighten the controls on petty manufacturers and even hawkers. In the food manufacturing system controlled by large companies, a recall system is imperative when food does not meet specified norms. The uk has it, which is why it could ask Coca-Cola to recall over 500,000 bottles of water that contained bromate in excess of norms. But the new bill gives with one hand and takes away with the other. Section 18.g states: "Where any food fails to comply with food safety requirements is part of batch, lot or consignment...it shall be presumed until the contrary is proved, that all of the food in that batch, lot or consignment fails to comply with those requirements" and so it can be recalled. In section 26.5 says: "Where any food which is unsafe is part of a batch, lot or consignment of food...it shall be presumed that all the food in that batch, lot or consignment is also unsafe following a detailed assessment within a specified time, it is found that there is no evidence that the rest of the batch, lot or consignment is unsafe." If there are different categories of food businesses in the country, then penalties should be graded in a way that each group is affected equally. But clearly Indian policymakers do not think this is necessary. The bill specifies penalties between Rs 1 to 10 lakh, depending on the nature of the offence. It defines food-related offences -- like generally not of quality food, sub-standard food, misbranded food and penalty for misleading advertisement. There is no specific penalty for unsafe food or food with contaminants. Moreover, considering the range of fines provided, it would be a deterrent for the small, not the big players. Japan, for instance, provides for penalties based on turnover, which provides a level playing field. There is a provision under section 69 (power to compound offences), which empowers food inspectors to impose fine of up to Rs 1 lakh on petty manufacturers, hawkers, retailers etc. if they have "reasonable belief" that an offence has been committed. This means unbridled power for inspectors and terror for vendors, hawkers and small manufacturers. In contrast, provisions for powerful companies are riddled with a space-size loophole. Under section 66, the bill states that action cannot be taken against people if they prove that an offence was committed without their knowledge or that they had exercised due diligence to prevent it. One of the most fatal provisions of the bill is regarding governance and administrative design. It puts in place a highly centralised and closed structure, accountable to none. The bill proposes a Food Safety and Standards Authority as the statutory body to perform various functions assigned under the act. The authority includes seven new positions for bureaucrats, representing different departments, thus replacing the Central Committee for Food Standards (ccfs), which is mandated under the pfa Act to oversee decisions on food safety, with a bureaucracy armed with officials. The current system needs reform. It needs independent and credible expertise for standard-making on health and food-science. But the bill compounds the weakness of the current decision-making structure. In the present system, expertise is externally sourced, through various committees of the ccfs like the food additives sub-committee and the pesticide residue sub-committee. The Bureau of Indian Standards, which functions under the ministry of consumer affairs, was kept out of the loop and will remain out of it if the new law is passed. Outsourcing of expertise will continue. Worldwide, food safety authorities have internal research set-ups, and the scientific and technical skills to drive the standard development process well. External experts, including consumer organisations, ngos, health experts and lab experts are brought in through specialised committees to add value to the internal work and improve it further. But industry representation is kept to the minimum to avoid conflict of interests. Under the present regime, the primary responsibility for enforcement and monitoring lies with state governments. Unfortunately, they do not have the capacity to carry out the job. A crucial weakness is the lack of specialised laboratories. With this bill government had the opportunity to rectify the problem but it has failed. Not only has it failed in this respect, it has compounded matters by not taking into account the fact that the proposed bill will replace all state and central legislation dealing with food. Many of the state laws are not related to only food quality and adulteration. They are also related to price, and availability and distribution of food. Some of them were enacted to ensure availability of food at affordable prices for the poor. But it does not address issues of food availability, pricing, monopoly or distribution. Also, the bill does not deal with what the role of the bureaucracy, which deals not just with food but also drugs and cosmetics, will be. In the new bill, food and drug inspectors have been named food officials, but it does not say if they will monitor drugs and cosmetics. The bill intends to combine separate pieces of food-related legislation under one broad law. And it is being done for the convenience of a few. While industry may be looking forward to the bill being passed in parliament without a hue and cry, the fact remains that it will neither improve the process of setting standards, nor improve the mechanism of ensuring food safety, especially in a world in which contaminants are proliferating. This is a bill without a vision on either health or livelihoods. In the end, it could be bad for business as well.